Hello world like example for Digilent Nexys A7? Hi everyone, I'm a beginner and I'd like to just get up and running with my Nexys A7. This is my first FPGA board, and I'm a complete beginner. I don't have any particular goal in mind at the moment beyond learning and getting some very simple example running. I prefer to learn by actual code that works, modifying it and using that as a basis for learning, rather than just reading a comprehensive manual. What should I do? I thought I'd find a hello world example, but it seems hard to find anything at all that gives a step-by-step tutorial for how to get anything to run on the Nexys A7. If anyone could share a tutorial for how to do something very simple, such as turn on a LED on the board, that would be awesome. I have Vivado installed on Ubuntu 18.04, the application seems to be working. My board is a Nexys A7 with an Artix-7 100T CSG324. Welcome to the forum and to the world of FPGA. You can find some resources here: https://reference.digilentinc.com/learn/programmable-logic/tutorials/start and if you look for Nexys 4DDR (which is the old name for Nexys A7) you can find other things. I suggest you to start with led blinking. Connecting the switches to the leds, trying to work with the seven segment display, and moving forward to the VGA. I think this might be a good start for you until you get your hear around the board. I hope you'll enjoy the learning process. Thanks Bianca, I'll take a look at this example and do as you suggested. I'm trying to follow the guide now. I'm having trouble getting it to load all the boards, I only see six boards in total. The guide tells me to follow the steps here: https://reference.digilentinc.com/vivado/installing-vivado/2018.2 to install all the Digilent Board Files. But I don't get any new boards available, sadly. I'm running it as root just to make sure there are no permission issues, and root also has a copy of the same (correctly edited) Vivado_init.tcl file. /tools/Xilinx/SDK/2018.3/data/boards/board_files and copied everything from the Git repo to that folder. I then restart Vivado (I start vivado by running as root /tools/Xilinx/Vivado/2018.3/bin/vivado). But I have no new boards. Make sure to only copy the contents of the new folder into the board_files folder. Thanks for the help. Here is a screenshot. I managed to solve this by copying the board files into both SDK and Vivado, as well as reinstalling Vivado with the 30 trial license, I had the free one before that. 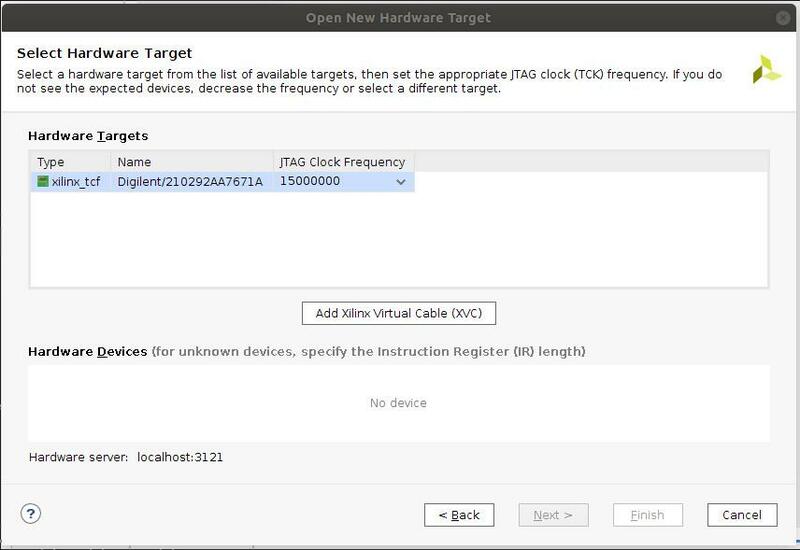 1) Here is a xilinx AR showing how inst﻿all the xilinx/digilent cable drivers﻿. If you have not already. Make sure to be root. 2) I am added to the dialout group. However, I also tried as root, so it shouldn't matter. 4) Yes, I'm doing all of this as root. Here is a forum thread that deals with the error you are having with djtgcfg enum. Also if you haven't yet I would suggest rebooting your PC. I've read the other thread. It is not clear to me what install.sh files should be executed, and how. Any arguments? 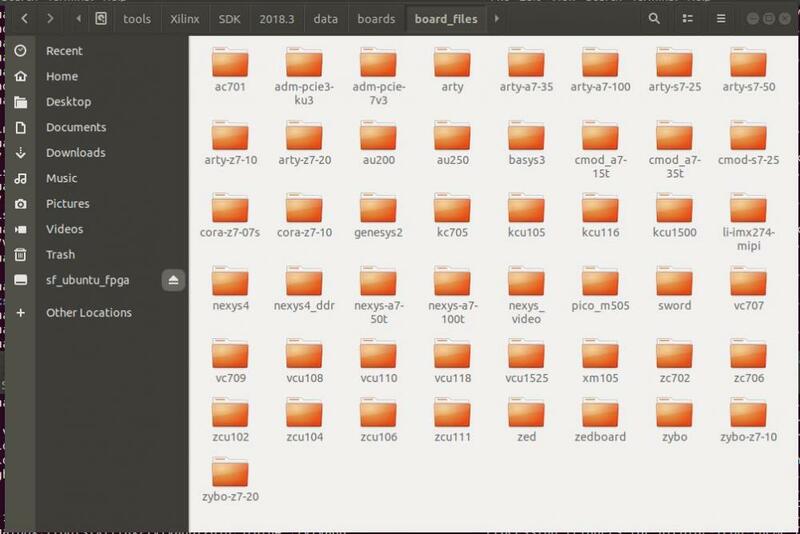 Should I just find all install.sh files in the directory tree of the Xilinx installation, and run them? I've tried to reboot, yes. I can also mention that this is a brand new Ubuntu 18.04 install. Did you install the Digilent runtime and utilities by running install.sh in *.gz files. I've now manually installed the FTDI drivers too. However, I don't understand the quoted statement. What install.sh files am I supposed to run? These are the install.sh scripts that I have available. It also seems like djtgcfg has quite a few dependencies which I don't have. libdabs is just one of them. 3. 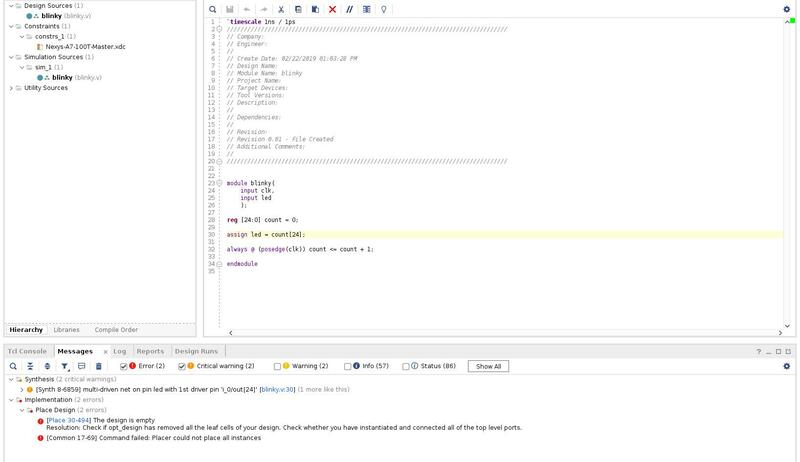 Re-run your modified version of digi_enum.py and post the output of the log file here. I finally have a working development environment, and the hardware manager recognizes my board. You have led set as an input in your hdl. Set it as an output and try generating the bitfile again. How did I miss that? Thanks. I have found that two specific steps help me avoid missing a lot of silly bugs when using Verilog. Glad to hear Vivado/SDK is working!